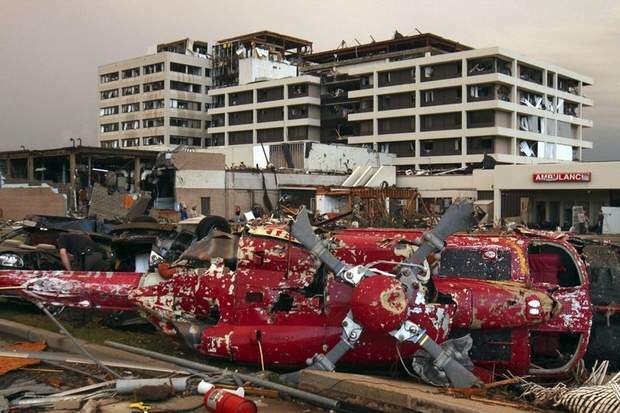 A powerful tornado barreled through Joplin, Missouri leaving a wide path of destruction and killing at least 30. 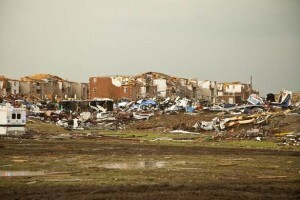 The tornado leveled a residential area of the city (population: 50 000) estimated to be as large as 20 blocks. Many people are believed to be trapped inside destroyed/damaged buildings. 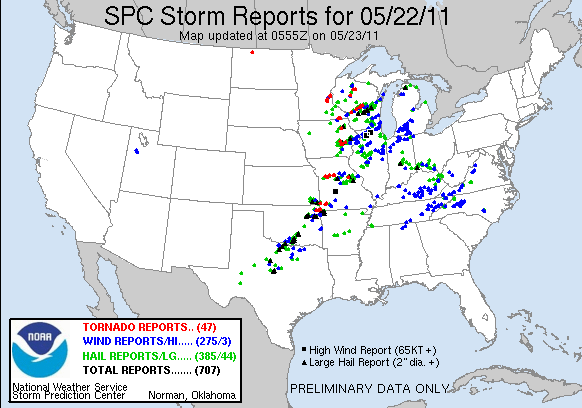 The Storm Prediction Center (SPC) had received 47 reports of tornadoes across at least 6 states and 660 other reports of severe weather across a total of 22 states, as of posting. “We have reports of significant structural damage to strong buildings..Automobiles have been flipped, bark was stripped off trees.” A meteorologist for the National Weather Service in Springfield said. 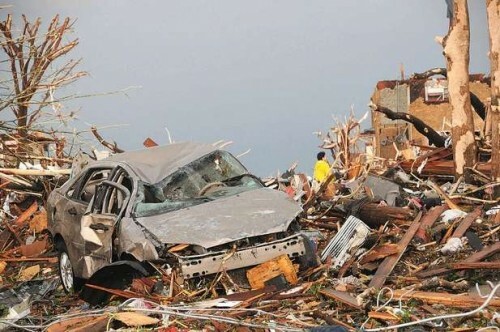 Dozens are dead and even more injured after nearly 50 tornadoes tore though parts of the Midwest on Sunday. 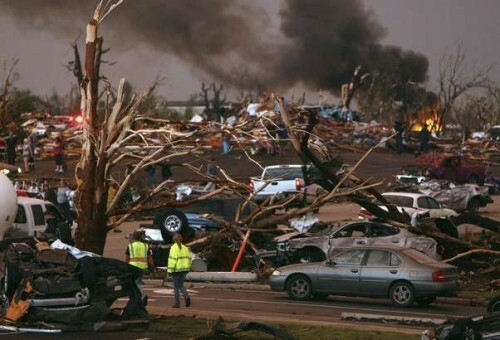 At least 24 people were killed in Joplin, Missouri, which received the worst of the severe weather. 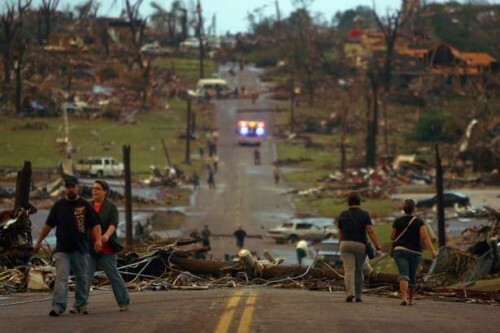 Damage was widespread across the city as homes, schools, and a hospital were hit by a massive tornado. Many of the dead were residents looking to seek shelter when the buildings they were in collapsed. The tornado traveled from the west-side of the city to the southeast. 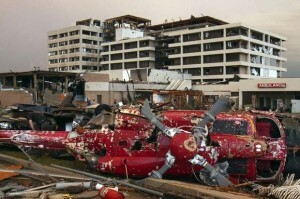 The southern edge of the city was the hardest hit. The tornado ranged from half a mile to three-quarters of a mile wide. While the exact strength of the storm is yet to be determined, it could be upwards of an EF4. Throughout the city, roads are littered with downed trees and buildings, making them nearly impassable. Interstate 44 also saw significant damage as 20 cars and tractor-trailers were overturned. 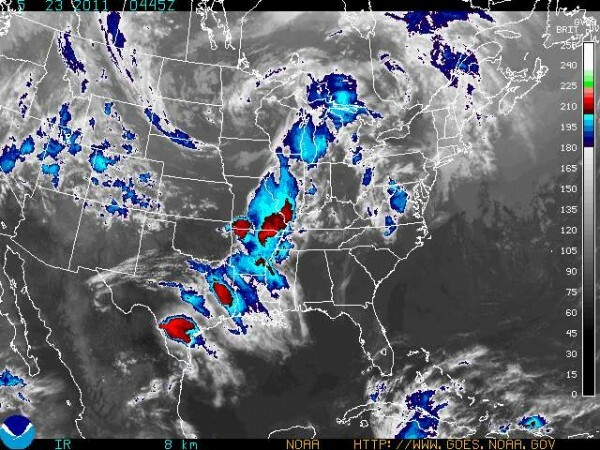 These storms are part of a larger system that triggered severe weather that killed one person in Kansas on Saturday night and caused damage from Minnesota to Texas on Sunday. At least one person was killed and 29 injured in storms that hit Minneapolis, Minn. 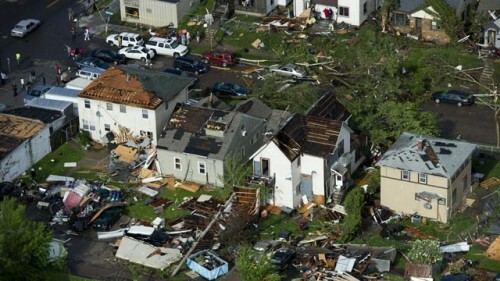 Meanwhile, La Crosse, Wisconsin was also hit hard as winds tore roofs off of homes and trapped residents inside. Further south, softball-sized hail was reported across eastern Oklahoma. The storms uprooted as many as 50 natural gas service lines in Minneapolis and suburban St. Louis Park, and CentrePoint Energy warned residents to be careful of gas leaks. Xcel Energy reported more than 20,000 of its customers lost electricity in the metro area. In the north-east Kansas, powerful storms spawned funnel clouds and hail that ripped limbs off of trees and shattered windows. About 200 homes were damaged in and around Reading with the tornado sweeping through the small town around 9:15 pm Saturday night, said Kansas Division of Emergency Management spokeswoman Sharon Watson. A man was pronounced dead shortly after being taken to Newman Regional Hospital in Emporia, about 20 miles from where the tornado hit. Severe thunderstorms pelted the region with hail that some Topeka residents claimed was the size of baseballs, authorities said this morning. The National Weather Service confirmed that a tornado also touched down in Topeka and northeast of the city near Lake Perry, where damage was reported at a nearby campsite.